Background: Endoglin is a marker of active, proliferating endothelial cells of blood vessels. In many cancers, it is present in both peripheral vessels and vessels located inside the tumor. Endoglin is more specific and sensitive compared to other tumor angiogenesis markers. It is suggested that endoglin can be considered a reliable marker of disease outcome. Objective: The aim of the study was to assess the expression of endoglin and to determine its potential usefulness as a complementary molecular marker of endometrial cancer. Method: The study included 60 women who underwent hysterectomy: 45 with endometrioid endometrial cancer (study group) and 15 without neoplastic changes (control group). The study group was further divided according to the degree of histological differentiation: G1, 17; G2, 15; and G3, 13. 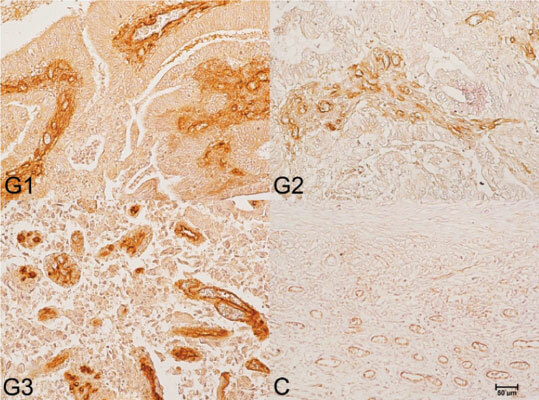 The expression of endoglin was determined immunohistochemically with mouse anti-Endoglin monoclonal antibody. The obtained reactions were evaluated using light microscopy. Results: Analysis of endoglin expression in endothelium showed that it reached 145% of the control. In G2, we observed that the endoglin level decreased and was similar to the control, while in G3 it increased and was even higher than in G1. In cancer cells, endoglin expression increased with the grade of endometrial cancer. Conclusion: Endoglin can be considered a valuable complementary molecular marker, allowing to visualize the advancement of the cancer process, including endometrial cancer. Endometrial cancer, endoglin, angiogenesis, molecular marker, vascular endothelium, immunohistochemistry.